The easiest way is to use a ready-made sizing for the canvas, such as shown on the right side "Sizing for canvas" by Tair. You just go to the store, buy the sizing and apply it to the canvas in two layers with an intermediate drying for 2-3 hours. If the canvas is sparse, and if after two-layer sizing of canvas holes are still visible on the canvas, then it may be necessary to apply another layer of glue. However, ready-to-use sizing is not always available, and it is relatively expensive, so it is better to perform sizing with self-prepared gelatinous glue. You can also use this ready-to-use sizing for the first layer, but apply glue made by you as second and third layers. To prepare gelatinous glue, you can take that food gelatin, which any housewife have usually in the kitchen. However, it is better to buy gelatin in the store of art goods, to be sure that it is suitable for this purpose. So, take the right amount of gelatin (see below), pour it with a suitable amount of water at room temperature and let this mixture stand for about an hour, so that the gelatin is swollen, that is, absorbed water. In this case, gelatin will remain at the bottom, and from the top you will get muddy water. Then we begin to heat this jar with undissolved glue in a water bath. The housewife knows what water bath is, and for others I will explain it. We pour cold water into a small saucepan, put our jar in this water, it is better with some kind of gasket under the jar so that the fire does not heat the jar of gelatin itself, and place this structure on the lighted cooker. Then we take a wand, a spoon or anything like it and begin to mix the gelatin mixture. We do this until a homogeneous, watery mixture of gelatin is formed in the jar, which does not contain clots, much less lumps. Having achieved this, we turn off the cooker, take out our jar from the saucepan and wait until our glue cools down. When cooling, the glue will thicken and soon become sticky, like a kissel. That is, when removing the stick from the jar with glue, the glue remains on the stick, almost not draining from it. We cool the glue exactly up to this point, not allowing a further thickening, that is, turning our kissel into a jelly. If the glue is too liquid, it will easily leak through the pores of the canvas to the other side, and if it is too thick, it will not fill these pores. If you missed this moment, then put the jar in a saucepan again and heat the glue until it liquefies. But the amount of gelatin will depend strictly on the amount of water taken. The weight of gelatin should be 7-10% of the weight of the ready-to-use glue. For the first layer of sizing, it is better to take a thicker glue so that it does not leak through the canvas, for the second and third, it is senile, so that it spreads more evenly and penetrates into those pores that have not been closed by the previous layers. Since the specific unit weight of water is 1 gram per milliliter, 10 grams of gelatin and 90 milliliters of water are needed to obtain 100 grams of 10%-glue. 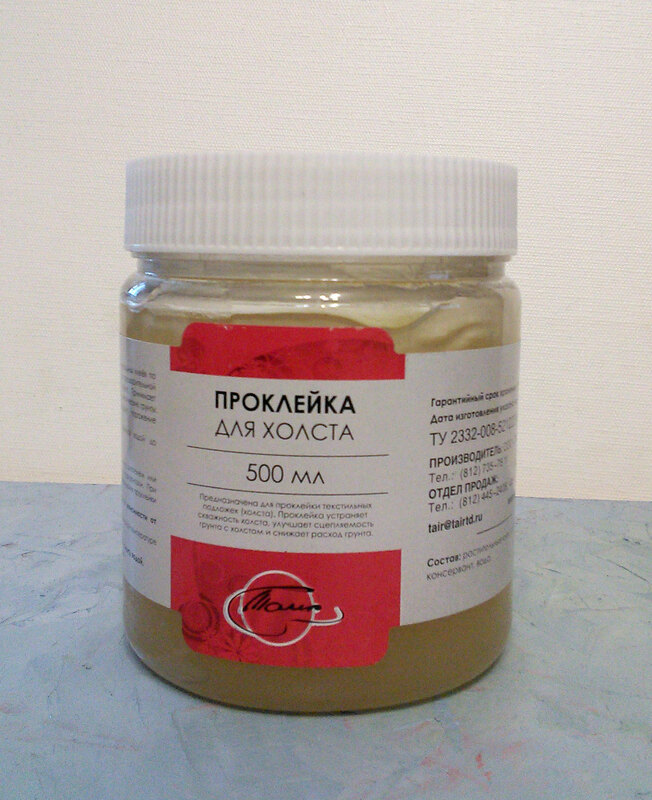 That our glue became 7 percent, it is necessary to take correspondingly 93 ml of water and 7 g of gelatin. If you need 200 grams of glue, just multiply these numbers by two. If 150, multiply them by one and a half. And so on..
Well, our glue is ready and has the right consistency, now it remains to apply it on the canvas with a masonry paintbrush, that is a wide flat brush. Of course, the canvas should already be ready by this time, otherwise, while we are busy with it, the glue will thicken. However, you can, as I wrote above, just warm it up in a water bath. The first gluing is done with 7-10% gelatin glue. If the canvas is sparse, prepare the glue thicker, if it very dense, make gluie more senile. I read somewhere that the canvas must be kept strictly vertical so that the gelatin does not pass to the other side of the canvas. However, I tried to do this both vertically and horizontally, but I did not see the difference. The most important thing is not to brush for a long time in one place. Brush any section of canvas one or two times, and do not touch this place any more, otherwise the glue will almost instantly thicken, and you will either just get a lump of glue on the canvas, leaving a thickened glue with a brush, or push it to the other side. By the way, do not forget to glue the edges of the canvas. Cover the canvas evenly with the first layer and let the canvas dry. But when drying canvas, it is better to put it vertically. How much to dry, I can not say - it all depends on the temperature and humidity in the room and the thickness of the threads of the canvas. Usually the canvas dries up completely in one day. But it is enough for us to stand it for 2-3 hours before applying the second layer. Before the second sizing, it is advisable to baste canvas with an emery cloth with an average grain. Do it without fanaticism, lightly. As a result, there will be a slight leveling of the surface of the adhesive layer, and it will become rough. And threads not covered with glue become slightly swollen. Do not sweep away the resulting adhesive dust from the canvas - it will help us with the next sizing. For the second sizing, it is better to use a 7% adhesive. Do not forget to warm the glue on the water bath, as it will have time to thicken while our first layer dries. So, sand the canvas, heat the glue and cover all canvas surfce with second layer of glue. This time, the canvas dries faster. After drying, we look at the light - did not there remain unfilled holes between the threads. If so, we will glue the canvas a third time, but we take the glue even more vigorously - now it is 5%. Then we dry the canvas finally. For about three hours you can start priming it. As you noticed, each next layer of glue is more and more liquid. If you have prepared a glue for all three layers, just add a little water to the glue when heating it before another layer of sizing. As I said above, you can use the ready-to-use "Sizing for canvas" for the first sizing, and you can use your gelatinous glue for the second and third sizing. Moreover, the shop gluing is not applied with a brush, but with a large palette knife or a table knife. Sometimes it turns out that even after the third sizing, unfilled holes remain between the threads of the canvas. I can not explain why this is happening-whether gelatin failed, or whether I glued it badly. 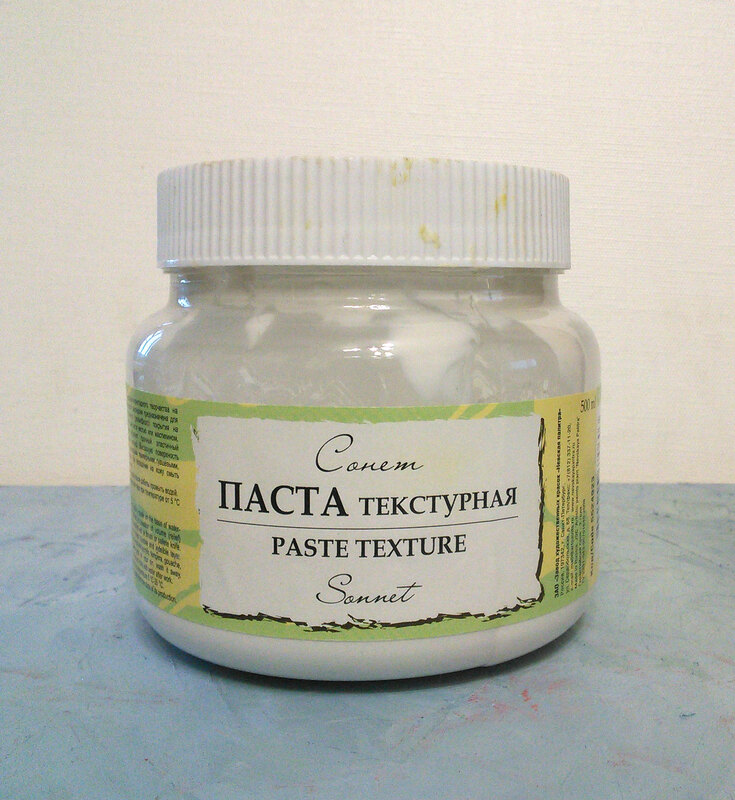 In this case, the texture paste, such as that shown on the left, is very helpful. 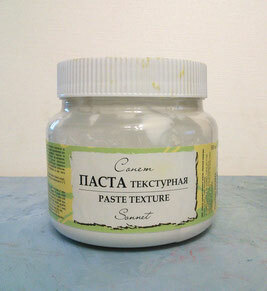 We take a palette knife and spread the paste evenly on the canvas. If desired, you can also add any texture.